Radicular cysts are the most commonly occurring cystic lesions in the oral cavity. The management of periapical localized cysts requires conventional nonsurgical root canal therapy. However, a multidisciplinary approach involving Endodontist and Oral surgeon holds the key to treat a large radicular cyst. 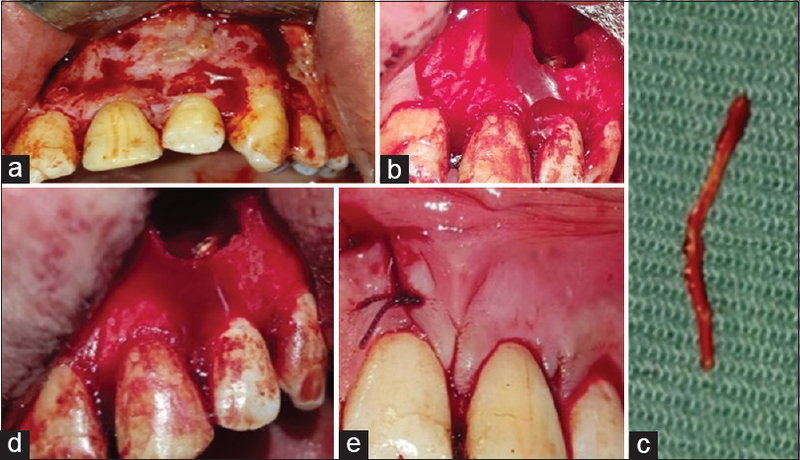 This article aims to report a successful multidisciplinary management of a large-infected cyst, which was associated with maxillary central incisor with open apex. The incidence of periapical cysts has been reported 15% to 42% of all periapical lesions,, determining whether periapical radiolucency is a cyst or a periapical granuloma cannot be done with tridimensional radiographic methods. Periapical cysts can be classified into two types: the periapical true cyst and the periapical pocket cyst. The true cysts have contained a lumen without a continuous epithelial lining, and so they are isolated from the tooth. 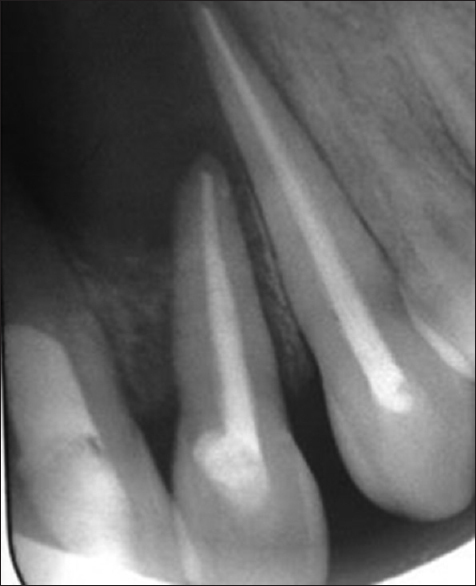 Pocket cysts have contained a lumen which is opened to the root canal of the affected tooth. Having their self-sustaining nature, true cysts probably does not heal by nonsurgical endodontic therapy, and always need a surgical intervention to remove cyst epithelium by the enucleation. 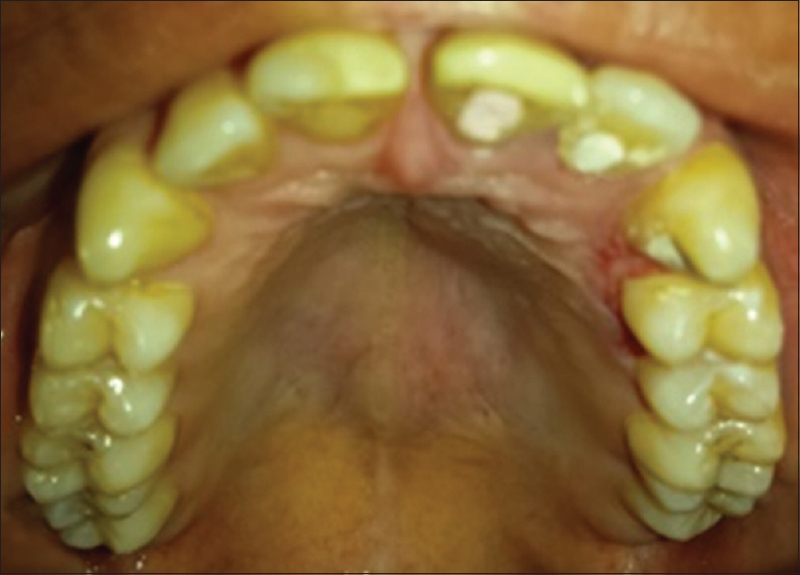 This article aims to report a successful multidisciplinary management of a large-infected cyst, which was associated with maxillary central incisor with open apex. 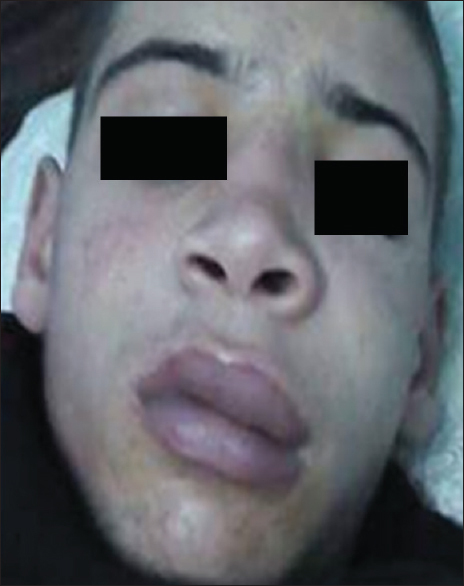 An 18-year-old male patient was referred to the Department of Conservative Dentistry and Endodontics, at the Clinic of Dental Medicine of Monastir, with the chief complaint of pain and swelling on the left side of the face. The patient reported a history of trauma in upper anterior teeth, which had occurred >7 years back and only the root canal of the central left incisor had been endodontically treated without a technique of apexification. The patient consulted a private clinic 6 months prior for a similar complaint, and access cavities of teeth 21.22 and 23 were left open. Extraoral examination revealed a nonwell-defined swelling in the canine space swelling of the left side of the face, extending into and involving the left eye [Figure 1]. Intraoral examination showed a symptomatic palatal swelling extended from the left central incisor to the distal part of the upper left canine [Figure 2]. Access openings of teeth 21.22 and 23 were found open, which were painful to percussion and exhibited Grade 2 mobility. Pus was flowing through the buccal sulcus of the teeth. 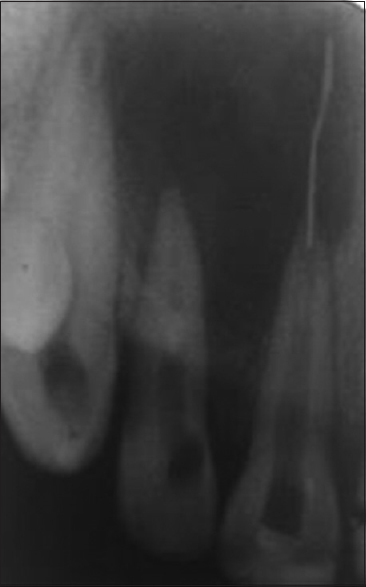 Radiographic examinations were conducted and showed a large well-circumscribed radiolucent lesion involving teeth 21.22 and 23 and the extrusion of the gutta-percha from the open apex of the central left incisor [Figure 3]. The patient was subjected to cone beam computed tomography (CBCT) scan for further exploration of the finding, to check proximity or any involvement of lesion with nasal floor, since lesion was extensive. CBCT showed that the nasal floor was intact and the radiolucency was seen in relation with tooth 21 in sagittal and coronal planes [Figure 4]a, [Figure 4]b, [Figure 4]c, [Figure 4]d.
The dimension of the lesion was measured using measurement scale which was around 3 cm *4.5 cm in maximum diameter. On the basis of history, clinical examination and radiographic finding, a provisional diagnosis of infected periapical cyst related to tooth 22 was made. Informed consent from the patient was gotten on the same day. After isolation with rubber dam, the root canal was cleaned and shaped using rotary nickel-titanium RevoS™ (Micro-Mega). 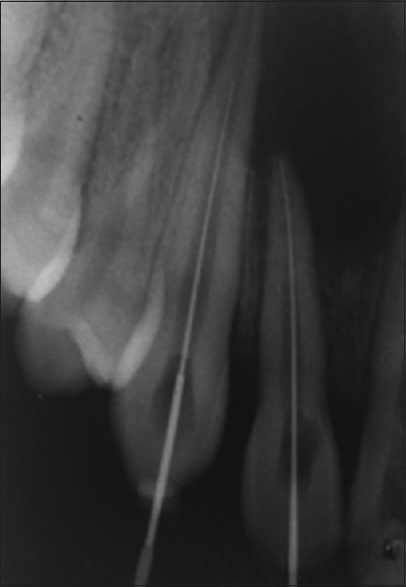 The working length was determined using radiograph. During preparation, the canals were irrigated with 2.5% sodium hypochlorite [Figure 5]. The root canals were dressed using calcium hydroxide for 1 week. The access cavities were sealed with temporary restoration. Root Canal Filing was achieved in a next appointment. The filling of tooth 21 with open apex was performed using Biodentine®as an apical plug and obtura system injection of thermoplasticized gutta-percha technique [Figure 6]a, [Figure 6]b, [Figure 6]c.
The teeth 22 and 23 were then obturated with gutta-percha and zinc oxide eugenol sealer using cold lateral condensation technique. The access cavities were sealed with composite resin. 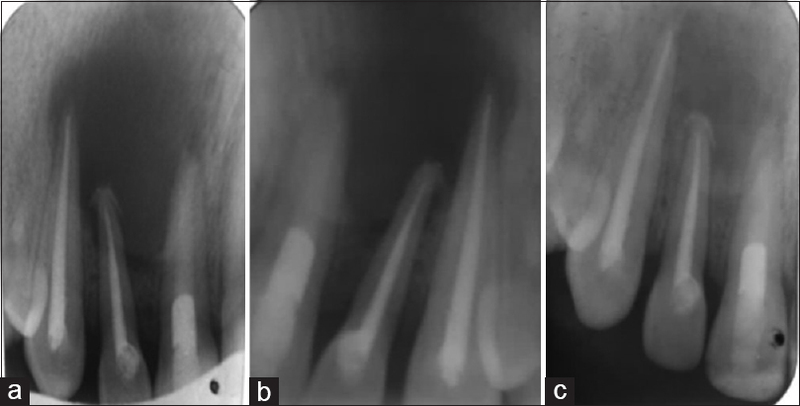 An immediate radiographic follow-up showed the successful orthograde filling of the involved teeth [Figure 7]. In a next visit, surgical enucleation of the cyst, elimination of the foreign body extruded from the apex of the 21. It was identified as gutta-percha point. Apicoectomy and retrograde filling of involved tooth were performed [Figure 8]a, [Figure 8]b, [Figure 8]c, [Figure 8]d, [Figure 8]e.
After administration of local anesthesia, cervicular incision was made in labial region from tooth 21–23. A full thickness mucoperiosteal flap was reflected [Figure 8]a, and a large bony defect with open apex of 22 was seen clinically. A complete curettage, with granulation tissue removal and enucleation of cystic lesion, were done. At the same time, an apicoectomy of tooth 22 was accomplished [Figure 8]b and the gutta-percha extruded from the apex of the 21 was eliminated [Figure 8]c.
A retrograde filling of the tooth 22 was performed with Biodentine® [Figure 8]d. Flap closure was done with 3.0 silk [Figure 8]e.
Granulation tissue was sent for histopathological evaluation [Figure 9]. An appointment after 10 days has been set for the removal of stitches and no symptoms or signs were noted [Figure 10]a and [Figure 10]b. The histopathology report confirmed the provisional diagnosis of an infected periapical cyst. The patient was recalled after 3, 6, and 8 months. On clinical follow-up, the patient was comfortable without symptoms. Follow-up radiographs were taken and showed the appreciable healing of the lesion [Figure 11]a, [Figure 11]b, [Figure 11]c.
The most frequent cystic lesion affecting human jaws is the radicular cyst with a percentage ranging from 52% to 68%. It can occur in relation with all sites of the jawbone but more frequent in the maxilla., The etiology is the infection of the periradicular space either because of trauma or caries, usually sterile unless it is secondarily infected. Swelling is the most important clinical symptom with a combination of pain. These manifestations are found in this case report. The CBCT has an important value in radiographic examination in endodontics and diagnosis of periapical lesions. In this case report, CBCT scan was demanded for further exploration of the finding and to check proximity or any involvement of lesion with nasal floor, since lesion was extensive. It showed that the nasal floor was intact and the radiolucency was seen in relation with tooth 21 in sagittal and coronal planes. The dimension of the lesion was measured using measurement scale (the periapical index) which was around 3 cm *4.5 cm in maximum diameter. A study compared the differential diagnosis of large periapical lesions (granuloma versus cyst) to traditional biopsy using CBCT. Large lesions were scanned, and a preoperative diagnosis based on gray value measurements of the imaged lesion area was made. After surgery, a biopsy report was obtained and compared to the CBCT diagnosis. In 13 out of 17 cases, the diagnosis coincided. In 4 out of 17 cases, the CBCT read cyst with the oral pathologist's diagnosis was granuloma. Thus, the CBCT may provide a more accurate diagnosis than biopsy and histology providing a diagnosis without invasive surgery and/or waiting a year to see if nonsurgical therapy is effective. Actually, there is gradual change in the attitude to the surgical treatment of periapical lesions. Some authors support that the immune system promotes repair and lesion might recede by the mechanism of apoptosis similar to the resolution of inflammatory apical pocket cysts without any surgical intervention. In view of the clinical and radiographic signs found in this case, the decision of a surgical management of the periapical cyst was taken. Apicoectomy and retrograde filling of involved tooth by the Biodentine™ allowed the hermetic sealing of the canal system. It is a necessary condition for preventing the recidivism. The surgical approach to cystic lesions of the jaws is either marsupialization or enucleation. The treatment of choice depend on several parameters: size and localization of the lesion, bone integrity of the cystic wall and its proximity to vital structures. Mineral trioxide aggregate and Biodentine® are widely used as root-end filling materials. In the current case, the lesion was enucleated along with curettage, followed by apicoectomy and placement of Biodentine® as root-end filling material. Clinical and radiographic follow-up plays an important role in the long-term success of the treatment of these cystic lesions and must be part of the therapeutic arsenal of both the endodontist and the oral surgeon. It allows following the healing of the lesion and as a consequence to avoid the failure of the treatment. Actually, there is gradual change in the attitude to surgical treatment of periapical lesions. The current concept in the management of radicular cysts is using nonsurgical treatment. However, the surgical intervention can be justified by several arguments. In this clinical report, the periapical cyst was treated successfully using a multidisciplinary approach. Endodontic therapy along with a thorough irrigation, cleaning, shaping, and filling of the canal space followed by the enucleation surgery and the elimination of the foreign body holds the key to success the management of large radicular cysts. Nair PN. New perspectives on radicular cysts: do they heal? Int Endod J 1998;31:155-60. Spatafore CM, Griffin JA Jr., Keyes GG, Wearden S, Skidmore AE. Periapical biopsy report: An analysis of over a 10-year period. J Endod 1990;16:239-41. Bhaskar SN. Oral surgery – Oral pathology conference no 17, Walter reed army medical center. Periapical lesions – Types, incidence, and clinical features. Oral Surg Oral Med Oral Pathol 1966;21:657-71. Ingle JI, Simon JH, Machtou P, Bogaerts P. Outcome of endodontic treatment and retreatment. In: Ingle JI, Backland LK, editors. Endodontics. 5th ed. Hamilton: BG Decker; 2002. p. 747. Nair PN, Sjögren U, Schumacher E, Sundqvist G. Radicular cyst affecting a root-filled human tooth: A long-term post-treatment follow-up. Int Endod J 1993;26:225-33. Kadam NS, Ataide Ide N, Raghava P, Fernandes M, Hede R. Management of large radicular cyst by conservative surgical approach: A case report. J Clin Diagn Res 2014;8:239-41. Uloopi KS, Shivaji RU, Vinay C, Pavitra TJ, Shrutha SP, Chandrasekhar R, et al. Conservative management of large radicular cysts associated with non-vital primary teeth: A case series and literature review. J Indian Soc Pedod Prev Dent 2015;33:53-6. Rees JS. Conservative management of a large maxillary cyst. Int Endod J 1997;30:64-7. Narula H, Ahuja B, Yeluri R, Baliga S, Munshi AK. Conservative non-surgical management of an infected radicular cyst. Contemp Clin Dent 2011;2:368-71. Selvamani M, Donoghue M, Basandi PS. Analysis of 153 cases of odontogenic cysts in a South Indian sample population: A retrospective study over a decade. Braz Oral Res 2012;26:330-4. Simon JH, Enciso R, Malfaz JM, Roges R, Bailey-Perry M, Patel A, et al. Differential diagnosis of large periapical lesions using cone-beam computed tomography measurements and biopsy. J Endod 2006;32:833-7. 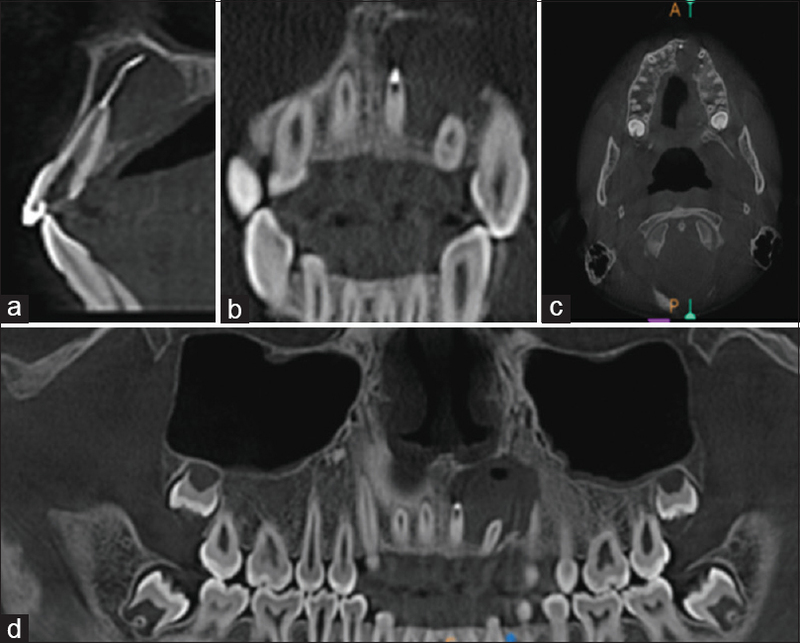 Diwan A, Bhagavaldas MC, Bagga V, Shetty A. Multidisciplinary approach in management of a large cystic lesion in anterior maxilla – A case report. J Clin Diagn Res 2015;9:ZD41-3. Vidhale G, Jain D, Jain S, Godhane AV, Pawar GR. Management of radicular cyst using platelet-rich fibrin & iliac bone graft – A case report. J Clin Diagn Res 2015;9:ZD34-6.